SpaceX has an ambitious agenda for the cosmos in coming years. The company began taking deposits from private citizens for a trip around the moon on the Falcon Heavy rocket. And it is working with NASA to carry astronauts to the International Space Station. SpaceX has an ambitious agenda for the cosmos in coming years. 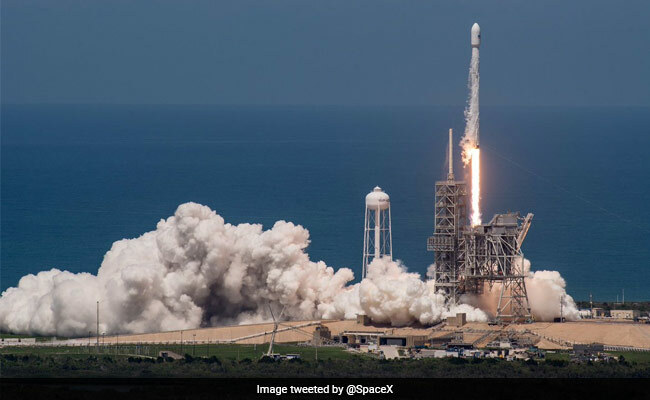 Elon Musk tamped down expectations about Space Exploration Technologies Corp.'s new rocket designed to carry private citizens into space, saying whoever chooses to be among the first passengers will need to be "brave." "It's guaranteed to be exciting," he said. When asked whether the risks would make potential customers pause before signing up for a flight, he said: "I want to make sure we set expectations accordingly." SpaceX has an ambitious agenda for the cosmos in coming years. The company began taking deposits from private citizens for a trip around the moon on the Falcon Heavy rocket. And it is working with NASA to carry astronauts to the International Space Station. But the company has only transported cargo so far, and Musk said shifting to carrying passengers is "a huge step up." Getting certified to carry NASA astronauts has been a challenge for SpaceX, as there is a much higher bar than transporting hardware for the agency, Musk said. He called NASA's oversight for "really tough" but justified because of the potential risks to humans. "It's the right motivation," he said. SpaceX and NASA are now working through some "small technical bones of contention" for certification to carry passengers, he said. Meanwhile, the U.S. Federal Aviation Administration, which regulates commercial space flight separately from NASA, hasn't yet set certification standards for carrying private citizens for hire. The company continues its attempts to reuse more of its rockets and launch equipment, a more-efficient approach that has been the biggest innovation in space flight in recent years, Musk said. SpaceX has successfully landed its rocket boosters and used them again. It's now "quite close" to being able to reuse the fairing that clamps over the rocket's payload, a relatively light-weight aerodynamic cover, he said. The fairing costs between $5 and $6 million. "Imagine we have a pallet of cash worth $6 million dollars falling through the sky," Musk said he has told his staff. "Would we try to catch it? I say we do." He didn't provide details about how the fairing would be captured. Musk's talk on Wednesday was to an overwhelmingly friendly audience of scientists as eager as he is to explore space. Topics ranged from how his project to build tunnels to stem the Los Angeles region's traffic congestion might help colonize Mars to the health risks of traveling beyond Earth's atmosphere. He downplayed the potential for human conflict on Mars, calling it "pretty open territory" where competing entities could find plenty of room without challenging each others' claims. After praising NASA and noting it stood to get increased federal funding, he drew applause. The billionaire entrepreneur said development of the Falcon Heavy had been much tougher than he imagined. By adding two additional boosters to each side of a rocket, it added to the vibrations, created new stresses to the main rocket and was difficult to test without an actual launch. "There is a lot of risk associated with Falcon Heavy, a real good chance that that vehicle doesn't make it to orbit," he said. "I'm saying full disclosure here, man." Government reviews have echoed some of his concerns. The Government Accountability Office found earlier this year that SpaceX and competitor Boeing Co. must contend with potential safety hazards that may postpone approvals for transporting astronauts until 2019. A U.S. contract with Russia for transportation to the space station expires that year. The GAO's findings follow a September report by NASA's Office of Inspector General, which warned of "multiple challenges that will likely delay the first routine flight carrying NASA astronauts to the ISS until late 2018." Agency funding challenges, delays in NASA's evaluation process and technical challenges with spacecraft designs have all contributed to the program falling behind schedule. There have been two major mishaps with its rockets since 2015, a sign of how difficult rocket science can be. On June 28, 2015, a SpaceX Falcon 9 rocket disintegrated shortly after launch from Cape Canaveral, Florida. Another Falcon 9 blew up on the ground in Florida. But SpaceX has also had numerous successes, making it one of the most formidable companies in the space market. It has pioneered reusable rockets, for example, which it has successfully landed in Cape Canaveral and on an ocean barge.